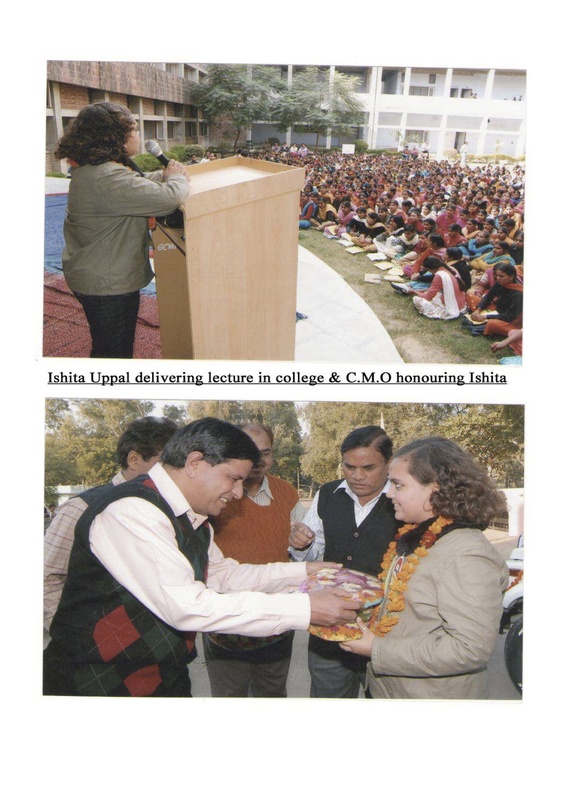 The Jagriti Mission Ishita Foundation works for the rights of women. The main driving force behind is Ishita Uppal, the young activist, the one who inspired the foundation of this organization. At JAGRITI Mission Ishita Foundation, we aim at saving the Girl Child to maintain the gender-ratio; and to save our planet Mother Earth by planting more & more trees to maintain the ecological balance We are working for the empowerment of women, creating awareness among the masses about education, health, legal rights, hygiene and also regarding family issues. We are also adopting the poor school girls bearing their their educational & other expenses. 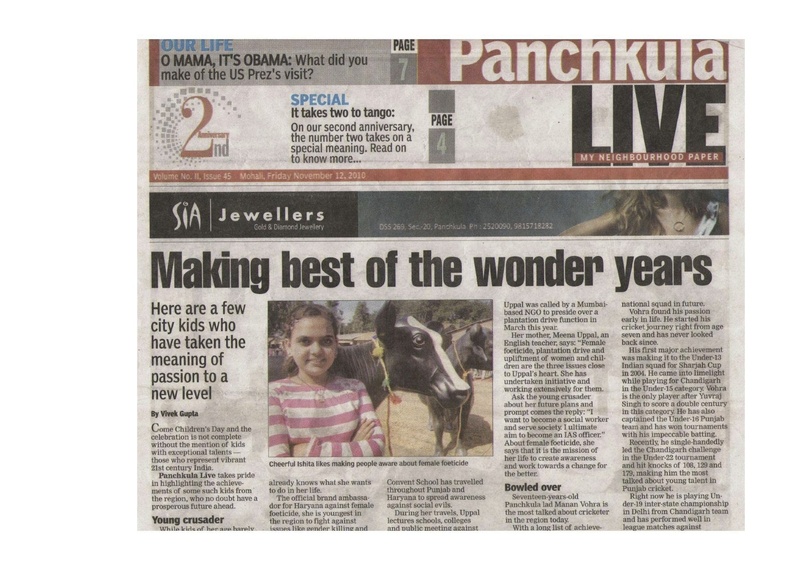 Ishita Uppal has been engaged in social work since the age of 10. She delivered her first lecture in a public-gathering only when she was 11 & after that there was no looking back. 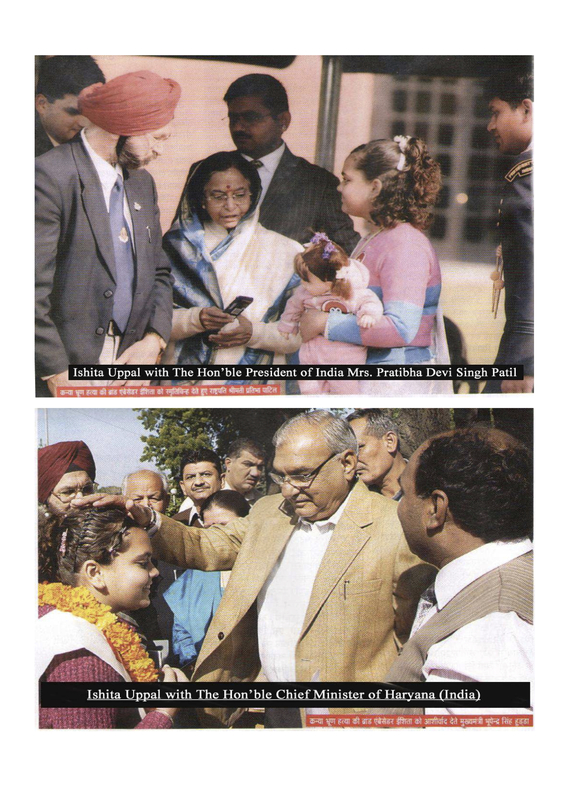 At 12, she was designated as the Brand Ambassador by the Chief Minister of Haryana Sh. B. S. Hooda on November 19, 2009. Since then, she embarked on a journey to make her countrymen aware of the problem of Female-Foeticide & Global-Warming, which are great threats to the survival of mankind. She proved to be a source of inspiration for the foundation of this Organization. It has been formed with the motive to root out the problem of Female-Foeticide and Global- Warming as the word Jagriti sounds “awareness”- the Foundation is working to create awareness among the masses with the slogan “ Ped Lagao Beti Bachao”. When we have to save the Girl Child, we have to save our Mother Earth too- as both are equally important for the mankind. The Foundation is creating awareness through various activities and encouraging people especially youth to come forward for the cause with a change in their mindset. Both the Rural and Urban areas are covered during the Campaign in the Schools, Colleges, Health Departments, Clubs and many other Organisations. The Foundation is holding Road-Shows, Essay-writing & Painting Competitions, Seminars, Handicraft Workshops, taking on Plantation Drives, organizing Lectures, Yoga and Karate Camps for the Girls. We are forming the Jagriti Youth Club- through which we are empowering the education of girls by holding free coaching classes for the under privileged girls by the club members. We are planning to open Shelter Homes for the abandoned baby girls & Handicraft centres for the destitute women. At the same time, I strongly believe that inspite of all these efforts, the awareness and counseling of males is of utmost importance; they should also come forward to protect the rights of women. Contact: Capt. D.K. Uppal(Project Director) 09803367560. E-mail: missionishitafoundation@gmail.com Regd. u/s 80G OF Income Tax. Dear Mohinderjeet, thank you for expressing your interest in joining the campaign. May I know if you are joining as an individual, or are you a leader of an organization?